The chart was compiled with the assistance of Simon Greenfield, especially via notes 1 and 2 below. Daniel Ximenes was a younger half-brother of the Rebecca Ximenes who married Emanuel Lousada #87, founder of Peak House where 3 generations of Lousadas lived, and developer of the nearby town of Sidmouth. Daniel lived a retired life in Rosemount Cottage on the Peak House estate (ref 65) where he died in 1829. A family business connection (see note 3 below) provided a background. A second link between Emanuel #87 and Daniel Ximenes arises because Daniel's third wife Sarah Aguilar was a daughter of a cousin of Emanuel #87, namely Abraham Aguilar #1794 (see Aguilar/Lousada chart)! A third link arises (see ref 45, note 45 to Chapter 5) because the first wife of Daniel Ximenes was the daughter of another cousin of Emanuel #87, namely Emanuel #135! A 4th link arises because Daniel Ximenes was a 1st cousin of Emanuel #135 via the Mendes da Costa connection shown above, while Emanuel #135 was a 1st cousin of Emanuel #87 through their Baruh Lousada connection. And there was a 5th link through a Lamego connection - for Isaac Mendes da Costa (brother of Rachel and Abigail shown above) married Rebecca Lamego in 1752 and was thus (briefly) a brother-in-law of Jacob #36 (who had earlier married Rebecca's sister Abigail and died later in 1752) making Daniel a nephew of Jacob #36 and hence a cousin of Emanuel #87! Incidentally, by our reckoning, Daniel Ximenes had 4 marriages. The chart shows marriages 1 and 3. His 2nd marriage was in Jamaica to a Sarah who died in Kingston in 1795 where Abigail also died. But Sarah Aguilar died in London and is buried at the Nuovo Cemetery, while his last marriage was in 1805 to Catherine Jackson who lived to 1842 and died in Cheltenham. 3. Records can be found of a Lousada/Ximenes business partnership 1751-75 which in 1765 was conducted at New Broad Street (this earlier record is not shown in the given link) and which in 1768 and 1770 was conducted at 11 Mark Lane, Tower Street. This evidently concerned the generation before Emanuel #87 who was born in 1744 and Daniel #951 who was born in 1761. 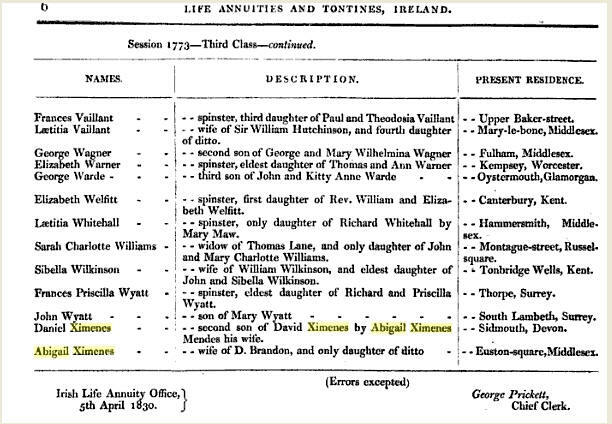 As Jacob #36 died in 1752, Emanuel #87 must have been very much a junior to the London Ximenes partner in the early days but presumably grew up rapidly! The vastly successful Aaron #125 his Jamaica uncle did not die until 1768.